State television also broadcast pictures of a roomful of weapons that it said had been captured from the town, the inventory mostly underscoring just what a crude and simple arsenal the opposition uses. It included 54 guns, 9 rocket-propelled grenade launchers, 5,000 cartridges, 25 satellite telephones and 24 mortars, the latter looking as if they had been welded by hand. The broadcast also showed the identification card of what it said was a Turkish fighter in the group, and a captured man named Abdelsalem Darwish said there had been a Turkish fighter and some Libyans there, as well as money and arms from Turkey. You call that Debunking? thats a pretty much weak Debunking case. 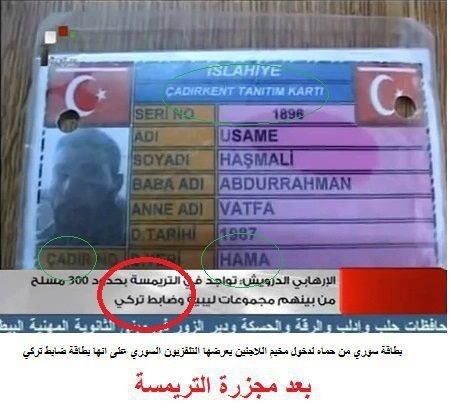 Brown Moses you do realize the Turkish ID card is from 2009 right? Thats why i called out as an weak try to debunk. My wife is Turkish and she's 100% certain that's not a Turkish citizens ID card, and I've seen plenty of them during my time in Turkey to know it's not either, so try harder next time Bruno. Hi Brown Moses, do you have any imagery of the 'welded by hand' mortars which you've described? Thanks. Those mortars are identical to Soviet pattern 82mm mortars. The indicators are the flash holes, fins and gas check bands. I don't think they are improvised.